One of my girls woke up with a sore throat today, poor thing. She's on the sofa behind me watching 'fixa rummet' (a program about children's bedroom make-overs) - yes, it runs in the family! Meanwhile, over on this side of the room...I've got a fab home to share with you. Shot by Kristofer Johnsson and styled by Saša Antić, it belongs to Stockholm based Gorjan Lauseger, a fashion and advertising stylist who works with well known magazines from all over the world. In his bio his style is described as 'clean, classic and sophisticated but always with a modern eye'. I think his home truly reflects this too, don't you? Photographer: Kristofer Johnsson. Stylist Saša Antić. Inspired by My Unfinished Home. The high ceilings, original period features, beautiful parquet flooring and the way the apartment has been furnished is indeed clean, classic and sophisticated. But what really stands out to me is the statement artwork. 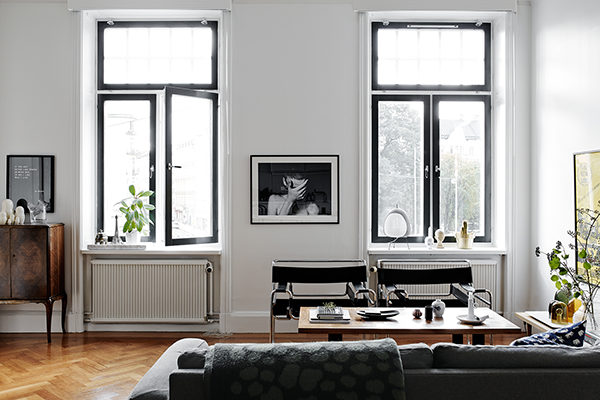 A couple of items I know and love: Sitting room: Hektar floor lamp, Svenskt Tenn elefant cushions, Kate Moss book and Baxton Studio leather and chrome chairs. 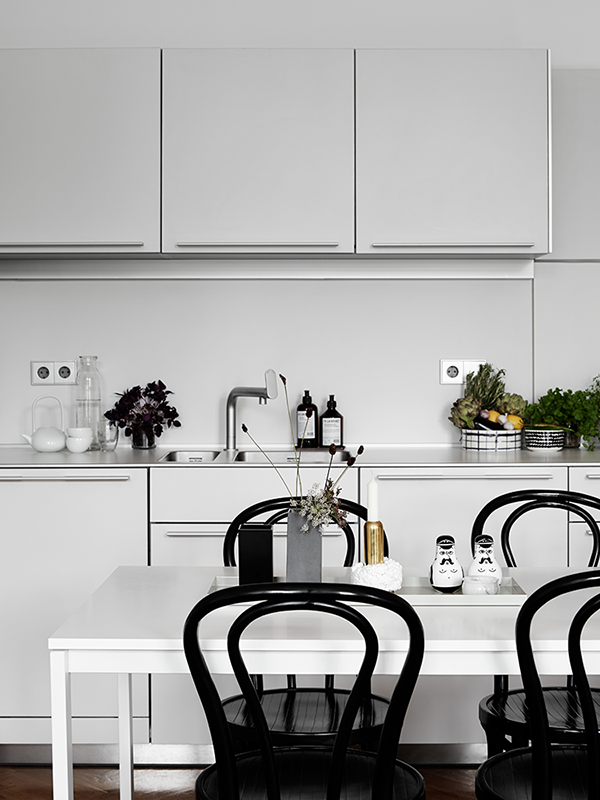 Kitchen: black and white Marimekko bowl, Thonet 214 chairs, Bedroom: classic white linen bedding, occasional LTR bedside table. 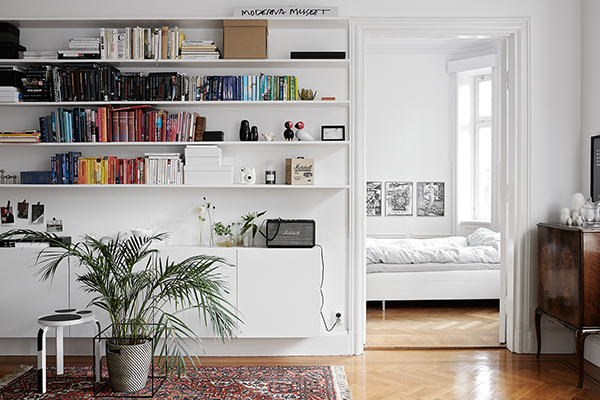 Is there anything you love about this space? 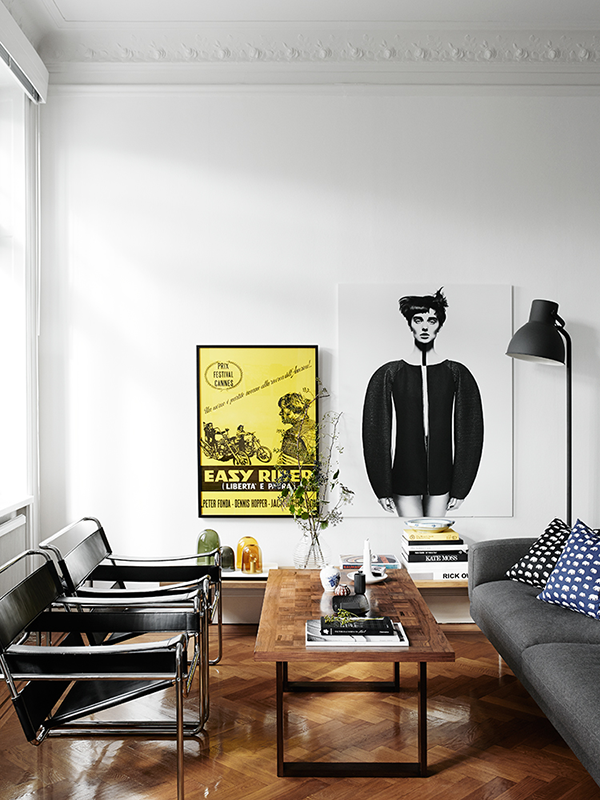 Some of my fave places to buy fab artwork for the home: The Poster Club, Artilleriet and Fotografiska. Plus more art photography inspiration here. Yesterday's Dutch cabin got me thinking about holiday plans (see my travel board!). I'm thinking Rock the Shack style rentals (inspiration on cabins, cocoons and hideouts) or glamping (again). If you're expecting visitors, I love this round-up of three very different ways to accommodate guests. Do you have any great plans for 2015? If you're thinking about visiting Southern Sweden drop me a mail, I might be able to help you find a holiday home on land or water! This is a very masculine space. Funnily enough, I was thinking that before I got to the last pic! I'm interested in the light fixture in the bedroom - any ideas? Hope your little daughter feels better soon. Aloha from Hawaii! I just like this light fixture.It is very unique fixture of home.Simple designs but looking nice. Who is the print by? Apologies, who made the artwork in the frame in the very last photo? The whole set is gorgeous! I had to pin just about every one of these images. Perfection! I love this. The simplest of decor and an airy feeling. Very inspiring. Wow this is gorgeous, my dream home! I love the white and black minimalism expressed here! white is clear and clean. People like white and do not want to make it dirty ... I want to re paint my sweet home. Thanks!! Does anyone know where the storage unit at the end of the bed is from? So love the use of white and the seating is awesome. very classy yet very clean, this home design reflects his style exactly as u said.